These are revelatory recordings. The compositional stature of Muzio Clementi has never really been fully acknowledged. Most people get to know his music through those sonatinas we all had to plough through when we were kids – but we didn't notice then that Clementi was one of history's foremost teachers of the piano: his pupils included Field, Cramer, Moscheles, Kalkbrenner and Meyerbeer, and Nicolas Slonimsky calls his Gradus ad Parnassum a "great book of études". The adjective is not one that Slonimsky bandies around easily. Now we find that he was also one of the outstanding symphonists of his generation. Clementi's piano music has made more headway in the recording studio than his orchestral music has: Horowitz was an early admirer, and his 1950 and '54 performances of three of the Sonatas (Op. 14, #3, Op. 26, #2 and Op. 34, #2) have re-appeared on an outstanding RCA CD, coupled with a 1979/80 live recording of the Sonata, Op. 33, #3 (GD 87753) – real ear-openers. And that live recording is of particular interest now since the first of these landmark discs from AS&V reveals that Op. 33 Sonata to be a version for solo piano of Clementi's only surviving piano concerto – and although it is not authenticated (the single manuscript of the orchestral version is not in Clementi's hand), it certainly sounds thoroughly idiomatic in its fuller form. 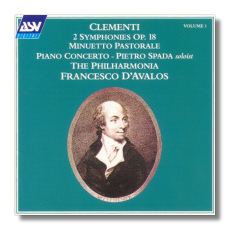 The prime mover of the Clementi revival, and soloist in this new recording of the Piano Concerto, is the Italian pianist and musicologist Pietro Spada, who over the years has devoted himself to the editing of Clementi's complete works. These three CDs provide ample justification for his efforts. Six (largely) complete symphonies by Clementi have survived – two early works and four mature and powerful statements from a composer in full command of his gifts. The 2 Symphonies, Op. 18, published in London in 1787, are all that has made it from what was apparently a copious orchestral output in Clementi's youth. The style owes much to Haydn, as you might expect, but they are sturdy and satisfying works in their own right, well-crafted and enjoyable. As Spada's notes point out, among Italians of the period only Salieri was producing anything of this quality. The undated manuscript of the Minuetto Pastorale bears an instruction that it was to form part of a missing symphony – but obviously a much later one, for the orchestral style shows a considerable advance on those early essays. Symphony #1 in C Major, like the others, dates from the last 25 years of Clementi's life (Spada doesn't seem to know exactly when), and shows the composer at the height of his powers. The beginning of the first Allegro is missing, and so in the 1930s Alfredo Casella attempted a completion; Spada's edition tries to establish a text closer to Clementi's original. Again like the other three mature symphonies, it is a big-boned work, and Clementi adds to the sense of size by adding three trombones to the orchestra – then an innovative gesture indeed. The sole autograph of the Symphony #2, curiously, is split between two sources (the British Library and the Library of Congress), and once more Spada had to rescue the music from Casella's well-mean editorial interventions. 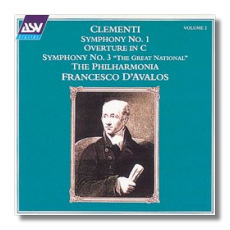 It confirms Clementi's scarcely suspected symphonic talent, its influences now absorbed to produce individual music of moving eloquence and power. With the Third Symphony, the "Great National Symphony", Clementi went some way to shooting himself in the foot, if for the noblest of reasons. In tribute to his adopted homeland, he based the Symphony on "God Save the King", which is hinted at earlier in the work, not least in the second movement, and announced unapologetically by the trombones in the finale. It almost comes off, and might have done with a better tune (now, if he had settled in Paris…). The gem of the four late Symphonies is #4, the source of which is again split between London and Washington. It begins with a spacious slow introduction that announces what was for those days an enormous sense of space; the scoring is similarly muscular. The music then launches into a powerful symphonic allegro that takes the best part of ten minutes to play itself out, displaying along the way a Beethovenian orchestral freedom (listen to the horns at the close, for example). The other three movements are conceived with a similar feeling for size: Spada justifiably claims that the slow movement hints at Schumann and Brahms and that the rhythmic insistence of the minor-key Scherzo (which Clementi rather modestly entitled "Minuet") foreshadows Bruckner; throughout, too, I wonder whether Schubert knew it. The two straggling works recorded here, icing on a particularly fine cake, are mature symphonic fragments; it isn't clear whether they were written for symphonies that weren't completed or whether they are all that has survived. The Overture in C has come down complete; that in D required Spada to provide a substantial part of the ending: the manuscript breaks off at the beginning of the recapitulation. Its opening, by the way, you'll find as the beginning of the Third Symphony, transposed to G, since that too was missing – Spada's surgery has been attentive and thorough. 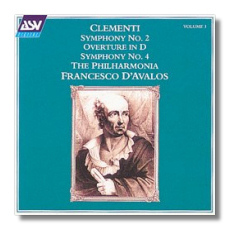 Francesco d'Avalos gets predictably fine playing from the Philharmonia, and AS&V give them a satisfyingly full-blooded recorded sound – necessarily so, for Clementi's beefy orchestral textures need it. All three discs can be strongly recommended, but if you want to dip before buying all three, there is no doubt that the Second and Fourth Symphonies are the ones to try first. You'll be back for more.